Surrounded by dizzying drops, Dunluce Castle perches on a headland overlooking the north Antrim coast, with a sea cave called the Mermaid’s Cave. Stories tell how, in 1639, the kitchen fell into the sea, along with the cooks and servants. In the famous novel, Ulysses, by James Joyce, Leopold Bloom commented that it would be a good puzzle to try and cross Dublin without passing a pub. The Book of Kells is a masterpiece of Celtic art unrivalled for the exquisite quality of its decoration, intricate designs, and visionary concept. It is regarded as one of the world’s greatest illuminated manuscripts with decoration so stunning and lavish that it was thought to be the work of angels. 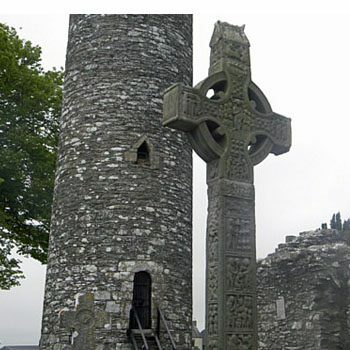 The Irish practice of erecting decorative high crosses dates from as early as c400. They are almost always associated with the remains of great monasteries. Some crosses are situated around the outer edges of these monastic enclosures indicating that they may have functioned as boundary markers for such sites. Others may have announced the holy place or served devotional purposes providing a focal point for prayers and religious celebrations. A Celtic cross combines a Christian cross with a circle surrounding the intersection. Although we cannot know for certain why this form of cross was adopted, it seems likely that high crosses stand as examples of the confluence of Celtic pagan traditions and the early Christian religion – a marriage of Christian and Celtic iconography. The Celtic cross linked two powerful symbols into one: the solar circle representing unity of all life and the Christian cross. The Celtic pagan system was nature-based with many gods in contrast with the monotheistic and scholarly religion of Christianity. Christian monks may have used such high crosses as teaching or preaching instruments for the Irish who were used to living by an oral tradition. 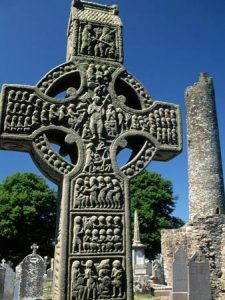 Many Irish high crosses are elaborately decorated from top-to-bottom and side-to-side with images from the Bible, the lives of Saints and in some cases, from pagan mythology. The process of transition from pagan to Christianity was a gradual one. For a long time monks were looked upon as a new class of druids. Many elements of the pagan religion got absorbed by the new church. This made Celtic Christianity unique from the type of Christianity that was practiced in the rest of Europe which had long been under Roman rule. It maintained its connections with the ancient Irish past and the Irish landscape. 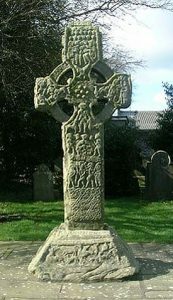 The Irish high cross also typifies the Celts’ positive approach to death. Roman depictions of Christ are often sombre whereas on Irish high crosses Celtic deities appear with radiant smiles. There is also some evidence suggesting that these crosses might have been brightly painted. Fortunately, many Irish High Crosses have retained their carvings over the centuries. Of particular importance are the magnificent crosses at Kells, Co.Meath; Monasterboice, Co.Louth; Moone, Co.Kildare; and Clonmacnoise, Co.Offaly.